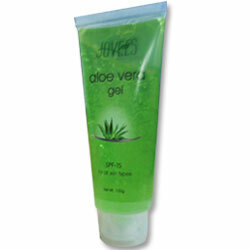 Buy Jovees Aloevera Gel SPF 15 protect skin from Sun burns, Itching, Dryness. Also an excellent recipe for skin wound. Help fight Pimples, Blemishes, Lift Away Impurities. This aloevera gel has been produced at the state-of-the-art manufacturing unit using latest scientific methods that help to retain the properties of herbs, plant extracts thus giving optimum results. It will protect skin from Sun burns, Itching, Dryness. Also an excellent recipe for skin wound. Apply all over face and body before and after sun exposure. Leave on. Aloevera, Carrot ext, Apple Green ext, Cucumber ext, Honey.